Organisation is the key to higher productivity. 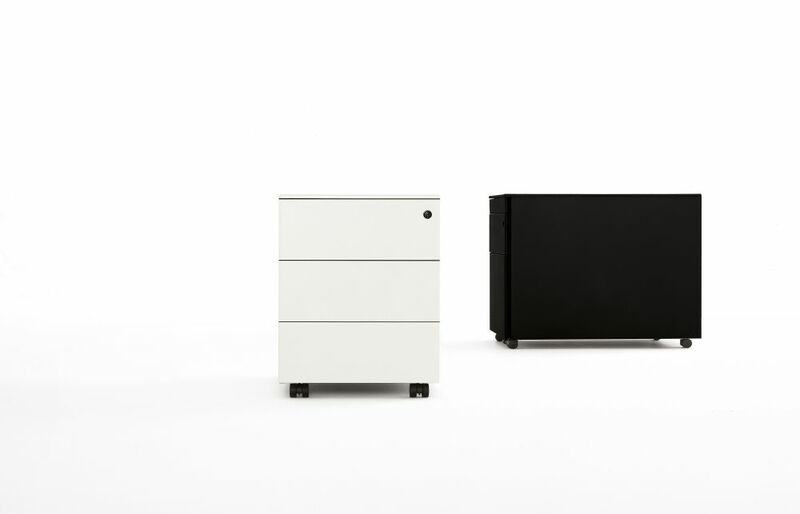 With our Bureau metal drawers you can tidy away your files and stationery and make finding them again easy. Made out of tough, dent-resistant steel, the drawers will keep your documents safe and the lock will ensure that no-one can access private information without your knowledge.The Bureau is equipped with a convenient stationary drawer with separate compartments for your pencils and pens. This will help you to keep your desk clear while ensuring that a pen is always close to hand.You can order your metal drawers with either a file sorter or normal drawers depending on what you want to store in them. The file sorter is perfect for dividing up your files into different categories so that you can access them that bit more quickly.Multi-directional castors make sure that the Bureau is easy to move around even when stuffed full of paper.The chests have full width drawers for a sleek appearance and come in three different paint finishes – satin black, satin aluminium and semi-matt white. No matter what the colour scheme is like in your office or study a Bureau chest of drawers should be able to fit in nicely.